The Roosa with Gold Balls Bracelet feels very light on the wrist, and yet the gold balls seem to draw the attention of others to it. You will receive many compliments on this bracelet. It is really fun to make and wear. It is available in two tone, sterling silver or yellow gold filled. The ball colors of sterling silver or yellow gold filled is your choice. This is a beginner weave. The clasp is not included in the kit. 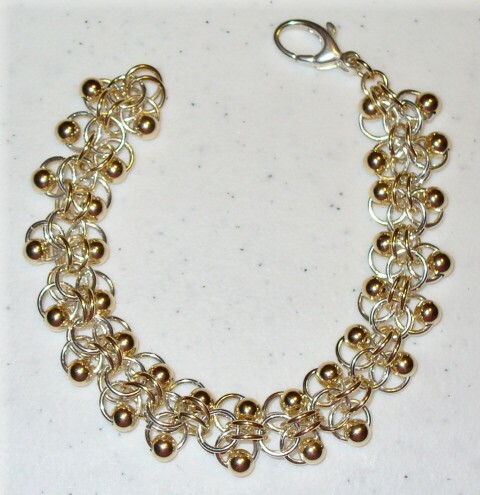 Roosa with Gold Balls Bracelet Kit - Two tone - sterling silver and yellow gold filled - balls not included.